52 MANTLE!!! The manner in which the Mickey Mantle 1952 Topps subject achieved its current mystique may never achieve full resolution, but it is surely "here to stay", with only the T206 Honus Wagner "Holy Grail" arguably surpassing "The Mick's" inaugural '52 Topps iconic stature. This cardboard marvel's sudden rise to stardom in the late 80's and early 90's ably assisted the overall market stature, with its incredible pricing points redefining one's perspective for utilizing cardboard heirlooms as viable investment options. For quite some time and before 2013, price tags for the 1952 Topps Mantle subject had remained relatively "flat", and while not diminishing in value, its pricing points had moved somewhat "sideways". 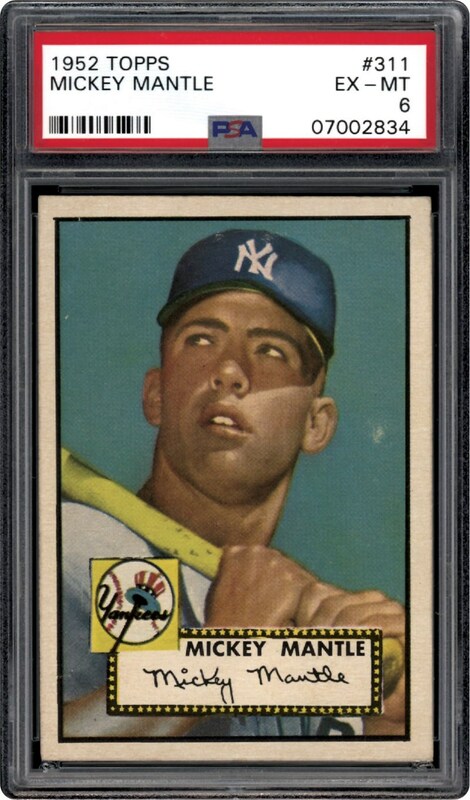 Typical with any market commodity, the investment values of valuable baseball cards likewise run in cycles, and the 1952 Topps Mickey Mantle card, dubbed the post-WWII "Holy Grail", is now experiencing an amazing pricing surge for all grade levels that have re-written its overall value. Synonymous with an uncontrollable brush fire, since mid-year 2013, the Topps Mantle rookie value has risen to an unprecedented level, with mid-grade specimens now fetching 300% - 400% pricing upticks. The outstanding eye appeal of this PSA 6 EX-MT offered specimen is synonymous with Mantle's magnificent legacy, starting with the classic bat over shoulder pose portraying a gorgeous aqua-marine blue background that atypically reveals no "snow" whatsoever. 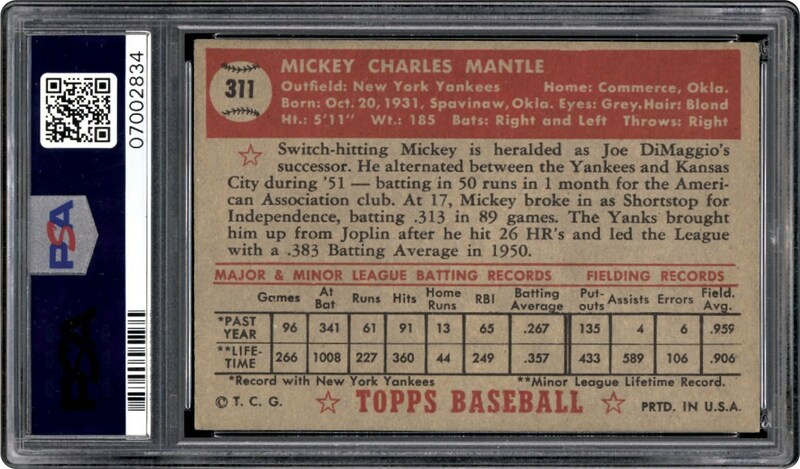 One of the cleanest "EX-MT" '52 Mantles you will ever come across, you can virtually feel Mickey's curious nature as he gazes into the future with a youthful innocence that would eventually lead to his immortal Yankee standing. The crystal clear clarity, sparkling facial hues, relatively clean white borders, and a clean verso all contribute to the EX-MT assessment. There is a very small white scuff next to his left ear. No obtrusive surface creases are evident and only some even corner wear prevents the card from achieving a higher grade.